You are here: Home / Inspire / Imagine having no talent. Imagine being no good at all at something and doing it anyway. Imagine having no talent. Imagine being no good at all at something and doing it anyway. These were the stations on the via dolorosa of Jacob Cohen, a.k.a. 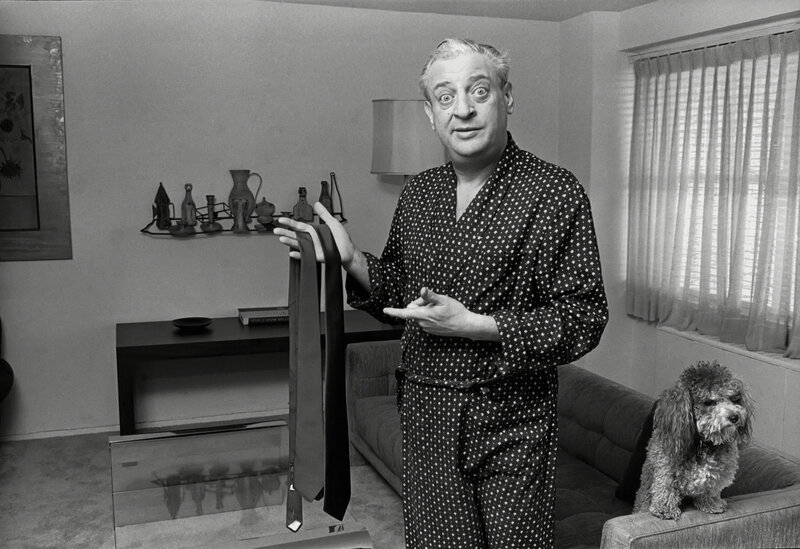 Rodney Dangerfield, whose comedy I hold above all others’. At his peak — look on YouTube for any set he did between 1976 and 1990 — he was the funniest entertainer ever. That peak was long in coming; by the time he perfected his act, he was nearly 60. But everything about Dangerfield was weird. While other comedians of that era made their names in television and film, Dangerfield made his with stand-up. It was a stand-up as dated as he was: He stood on stage stock-still in a rumpled black suit and shiny red tie and told a succession of diamond-hard one-liners. The one-liners were impeccable, unimprovable. Dangerfield spent years on them; he once told an interviewer that it took him three months to work up six minutes of material for a talk-show appearance. If there’s art about life and art about art, Dangerfield’s comedy was the latter — he was the supreme formalist. Lacking inborn ability, he studied the moving parts of a joke with an engineer’s rigor. And so Dangerfield, who told audiences that as a child he was so ugly that his mother fed him with a slingshot, became the leading semiotician of postwar American comedy. How someone can watch him with anything short of wonder is beyond me. Arguably it takes enormous talent to plow through perceptions of having no talent and truly honing that challenging carbon nugget into something that is brilliant. Brilliant. Yes. And make it all look like it is genetic. Brilliant, is the right word. Determined or obsessive are others. I admire someone that wants it so badly that he perseveres in the face of all odds. You have got to respect that grit. Makes ya wonder what drove him…. Yes, makes me want to read his biography. The link in the NYT doesn’t work – it says on my screen: Sorry, page seems lost…. Thank you Dave – works a treat now! Perseverance seems to be key for all kinds of success. I had to give up – this man, albeit doubtless very funny, speaks wahayyyy too fast for me… But great article in the NYTimes. Ta! when i came across rd, i could never help laughing out loud – he was fast and powerful with his words ! Me too! He is genius! Not always my genre of funny but kudos to him for never giving up. Ironically, I read a most interesting post by Otto von Münchow regarding talent that you may also find interesting! Thanks for sharing the link Dale. Great piece. Lol, but which came first, the sling shot or the ugly?